WTI crude prices have risen to the $45.00/b-$45.50/b range this morning. 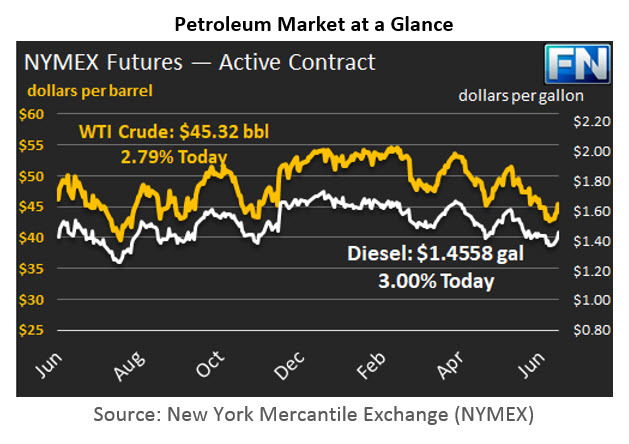 WTI prices strengthened to a close of $44.74/b yesterday, an increase of over a dollar for the day. WTI opened at $44.89/b today, a significant recovery of $1.19, or 2.72%, above yesterday’s opening price. Prices are $45.32/b currently, up by $0.58 from yesterday’s closing price. Diesel opened at $1.4395/gallon this morning. This was an increase of 3.6 cents (2.57%) above yesterday’s opening price. Current prices are $1.4558/gallon, up by another 2.28 cents from yesterday’s closing price. Gasoline opened at $1.4922/gallon today, a major increase of 4.56 cents, or 3.15%, from yesterday’s opening. Prices are $1.4917/gallon currently, up by 1.75 cents from yesterday’s close. This week’s upward price movement was reinforced yesterday by the release of the Energy Information Administration’s (EIA’s) weekly supply data for the week ended June 23rd. The EIA reported a small crude stock build of 0.118 mmbbls, which was more than counterbalanced by drawdowns of 0.894 mmbbls of gasoline and 0.223 mmbbls of distillate. Earlier, the American Petroleum Institute (API) had released its weekly data predicting significant additions to inventories: a crude stock build of 0.851 mmbbls, a gasoline stock build of 1.4 mmbbls, and a distillate stock build of 0.678 mmbbls. This had temporarily halted the price recovery. The official EIA data was bullish in comparison. The price rally remained strong despite weakness in apparent demand for refined products. Gasoline product supplied fell by 278 kbpd to average 9538 kbpd for the week. Diesel demand fell by 129 kbpd to average 4029 kbpd. Over the four weeks of June through the 23rd, however, gasoline demand increased by 221 kbpd on average, while diesel demand rose by an unusually strong 524 kbpd. The EIA also reported the year’s most significant drop in domestic crude production, a drop of 100 kbpd, which brought U.S. output down to 9250 kbpd. Most of the drop was caused by Tropical Storm Cindy shutting in production, but the growth in U.S. production already had slowed significantly in May and June. During the first quarter of 2017, U.S. crude production increased by 429 kbpd. During the second quarter to date, crude production has grown by only 15 kbpd. Even if we eliminate last week’s storm-affected drop as an anomalous week, production rose by only 115 kbpd during the second quarter through the week ended June 16th. Crude prices below $45/b have quelled some of the expansion in U.S. production, and it is possible that production is peaking.